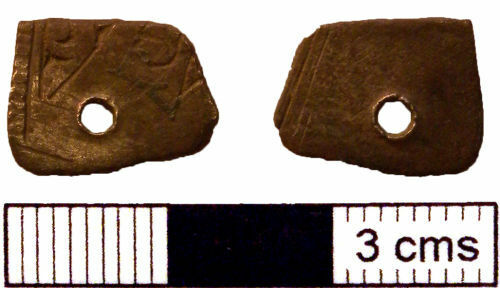 A possibly Middle or Late Saxon object. A trapezoidal fragment of silver sheet with engraved and niello-inlaid decoration on one face. One edge, which is followed by a line of fine hatching and an engraved line (forming a kind of ladder pattern), may be original, while of two others cutting across the decoration, one (longer and at right angles to the ladder pattern) is clearly chopped. There is a single off-centre circular hole (diameter 2 mm) pushed through from the reverse. The nature of the decoration is uncertain. There appear to be two fields bounded by straight lines enclosing short curved lines; both straight and curved lines have surviving niello inlay in places. On the reverse, three lightly engraved lines run parallel to the shorter of the edges that cut through the decoration; there are also some parallel lines scored obliquely across the front, between the ladder-pattern border and the hole. The object measures 12.5 x 10 x 1mm and weighs 0.73g. The object is almost certainly Anglo-Saxon and early-medieval in date. The presence of niello inlay on silver, plus the ladder pattern, might argue for a date in the 9th century. This object is more than 300 years old and contains a minimum of 10% silver. It therefore qualifies as Treasure under the stipulations of the Treasure Act 1996.